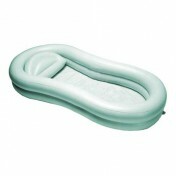 EZ Shampoo Deluxe Basin by Homecare is an inflatable basin designed for comfortable and convenient in-bed shampooing. This activity aid provides secure, form-fitting support that cushions the head and shoulders. 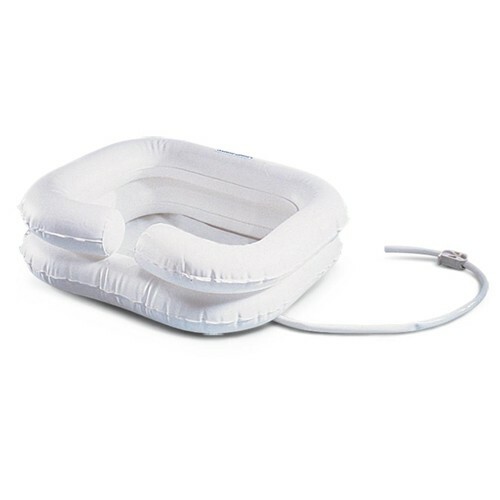 The built-in inflatable headrest on the shampoo deluxe basin can be adjusted to the desired degree of firmness for maximum comfort with its individual inflator valve. This bathing aid basin comes with a conventional drain hose that efficiently removes soap suds and water from the basin. This 36"L drain hose makes for easy emptying of the basin and prevention of spills. Use of this basin is simple, fast and comfortable. It is lightweight and compact for convenient storage and made of heavy-duty vinyl. The basin also comes with a custom drain stopper. EZ Shampoo Deluxe Basin by Homecare is an 8" deep, no-spill basin. It inflates to 28"L x 24"W x 6"H. The 2.5 gallon shower bag for the basin is sold separately. Both come with a 1 year warranty. This product comes with a conventional drain hose that efficiently removes soap suds and water. Overall this is a pretty good product. It can be also used for soaking of the arms and hands. We bought 2 one for just shampooing the head and the other for limbs. We also bought the 2.5 gallon rinse bag but can't use it yet until we get something to hang it on. i've bought to use with my bed-bound daughter and nephew. Due to their disabilities, it was extremely difficlut to keep their hair and scalp clean. Since receiving the shampoo basin, we are able to easily wash their hair whenever needed instead of waitnig for 2-3 people to be available to help. only problem so far is my daughter has a very short neck, making it harder to rinse her hair easily, but this is a minor problem compared to how difficult it has been previously to accomplish this task. Do you carry waterproof pillows? Washing your hair in bed! I had to be in bed due to a car accident. The most difficult thing was to wash my hair since I was not ambulatory.I felt dirty like crazy and I needed to do something about it. This portable basin was a great help for me. Easy to use and very convenient. Really great! !